Twelve kilometres away from Clarens and at the foot of the Maluti Mountains lies the Golden Gate Highlands National Park, which is renowned for its magnificent scenery. Weird rock formations in various shades of russet, ochre and purple, which have been sculpted from the sandstone cliffs by wind and rain, form a spectacular backdrop to the park. Below the cliffs the mountain slopes are covered in green vegetation and wild flowers. There are lovely indigenous trees in the sheltered ravines, while willow trees and poplars line the banks of the Little Caledon River. The area provides home to a variety of mammals including black wildebeest, eland, blesbok, Burchell’s zebra and oribi. Bird life is abundant and includes the rare bearded vulture and bald ibis. From fully furnished cottages to modest bungalows, even camping. 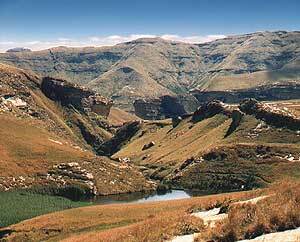 Golden Gate Highlands offers a range of accommodation. Situated in north-eastern Free State, Golden Gate Highlands National Park is a small park covering an area of about 116 sq km. The park derives its name from the brilliant shades of gold cast by the sun on the park's sandstone cliffs, especially the imposing Brandwag rock, keeping vigil over the main rest camp. This is a unique environment; a true highland habitat, providing home to a variety of mammals – black wildebeest, eland, blesbok, oribi, springbok and Burchell's zebra - and birds, including the rare bearded vulture (lammergeier) and the equally rare bald ibis, which breed on the ledges in the sandstone cliffs. Ribbokkop, the highest point in the park, reveals a breathtaking tapestry of red, yellow and purple hues as its warm shades merge with the cool mountain shadows towards evening.